The magic of aquatic plants lies in their beauty and diversity; the aesthetic considerations (such as texture, color, or bloom time) are nearly unlimited. We apply the same design principles for lily pools as for perennial and poolside gardens. A plant’s shape and size and its relationship to the garden and surrounding landscape are of utmost importance. It’s also important to vary plant heights. The flat leaves of lilies floating on the water’s surface and the lotuses’ slightly raised heads draw attention to the water’s horizontal plane. This is beautifully contrasted with vertical varieties of water plants, such as Scirpus or Typha. You can determine the number of plants to include in your pool by the kinds of plants you choose, their rate of growth, and the amount of time you have to maintain the water garden. Generally, one to two thirds of the water surface should be shaded during hot months. 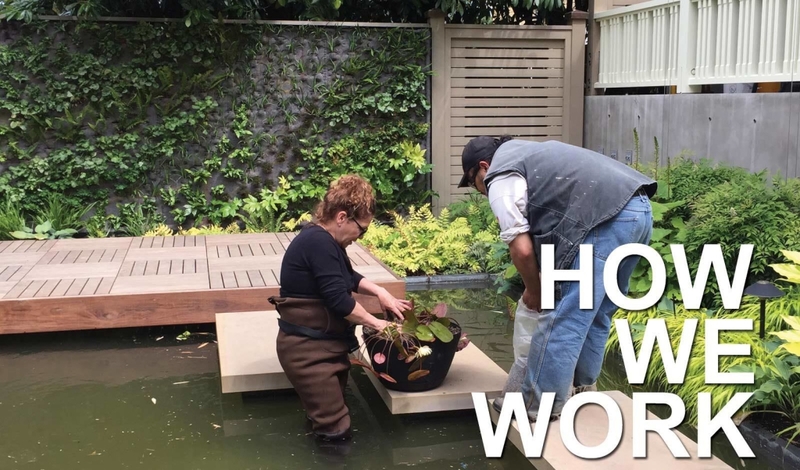 This will control algae bloom, keep water temperatures down, and keep your fish healthy (if you’re water garden also serves as a habitat for them). A water garden constantly evolves. It won’t look the same from season to season or year to year. After all, change is one of a garden’s greatest pleasures.